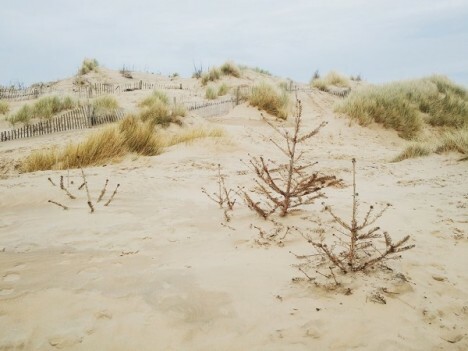 Every year, people around the world toss their Christmas trees without a thought as to where they will wind up, but some make their way to eroding beaches where they play a critical role in stabilizing sand dunes along the coast. 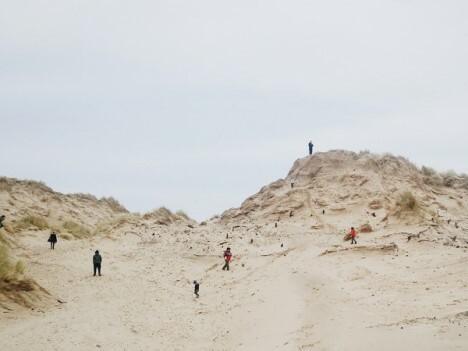 The beaches of Formby, near Liverpool in England, use donated trees to protect against wind and erosion, mimicking the natural actions of grasses. As they are buried over time, the trees also become anchors for those grasses, helping them regrow. Nearby residents are encouraged to contribute their own holiday trees to the mix. BldgBlog explains the multifaceted genius of this approach: “Compare this … to the widespread use of massive, industrially produced tetrapods for coastal erosion management—or even to the endless expense of so-called ‘beach nourishment’—and the idea of rebuilding the landscape using nothing more than linked chains of dead Christmas trees seems both tactically brilliant and cost-effective.” (Images by Fiona Croall and Robert Matthews). See more in Earth & Nature or under Science. March, 2016.